Spontaneous coronary artery dissection (SCAD) is an infrequent cause of acute coronary syndrome (ACS), , mainly affecting fairly young , otherwise healthy women. About 26 - 38% of cases occur in late pregnancy, peripartum or postpartum. ,,,,, The condition mainly involves left main stem or left anterior descending artery or both. ,,,, It was first reported by Pretty,  in 1931, in a young Caucasian woman who had a sudden death after developing chest pain. Since then only 116 cases have been reported in the literature. The incidence has been reported to range from 0.1 - 1.1%. ,,, The etiology of primary SCAD remains uncertain. Urgent coronary angiography and intravascular ultrasound (IVUS) are indicated in the acute phase in order to establish the diagnosis and determine the best therapeutic approach. ,, Medical therapy, percutaneous coronary intervention (PCI) and coronary artery-bypass grafting (CABG) have been applied in the acute phase  but optimal therapy is yet to be determined. Sudden death is the most common presentation, reported in 60 - 80% of the cases  whilst patients may also present with chest pain with or without ECG changes. We present two cases of pregnancy-related SCAD, both successfully managed, one with conservative treatment and the other with intracoronary stent implantation. A comprehensive review of the published literature since it was first reported in 1931 is presented. A 41-year-old woman, G3P3, previously fit and well, presented with a history of intermittent chest pains, which started 5 days after an uneventful delivery of her third child. Her chest pain became progressively worse and intolerable, which forced her to call the emergency medical services. The ECG manifested ST elevation across the antero-lateral leads with reciprocal ST depression in the inferior leads [ECG 1]. She was a smoker and was known to have hypercholesterolemia. The patient denied any illicit drug use. There was no history of any connective tissue disease and no significant family history of ischemic heart disease. Her antiphospholipid antibodies were negative. She underwent emergency coronary angiography, which demonstrated an occlusion of the LAD at its ostium, with appearances suggestive of dissection and no flow-limiting disease elsewhere [Figure 1]a. The patient underwent primary percutaneous coronary intervention after pre-dilatation and a Vision 3.5 x 28 mm bare metal stent (BMS) was implanted in the LAD [Figure 1]b. The procedure was well tolerated. This led to the restoration of Thrombolysis in Myocardial Infarction (TIMI) III flow, resolution of her pain and ECGs. The day after the procedure she became breathless and was found to be in pulmonary edema. She was treated with diuretics. Her subsequent echocardiogram revealed severe impairment of left ventricular systolic function with akinesis of the anterior septum, anterior wall, lateral wall, and apex. She improved and was discharged home on aspirin, clopidogrel, beta-blocker, ACE-inhibitor, frusemide, and statin. A 28-year-old woman, G3P3, 3 weeks postpartum, presented with sudden onset of pain in the left arm followed by severe central chest pain without any associated symptoms. She had a similar episode of left arm pain and chest pain a week prior to her presentation, which lasted for a few hours and settled spontaneously. 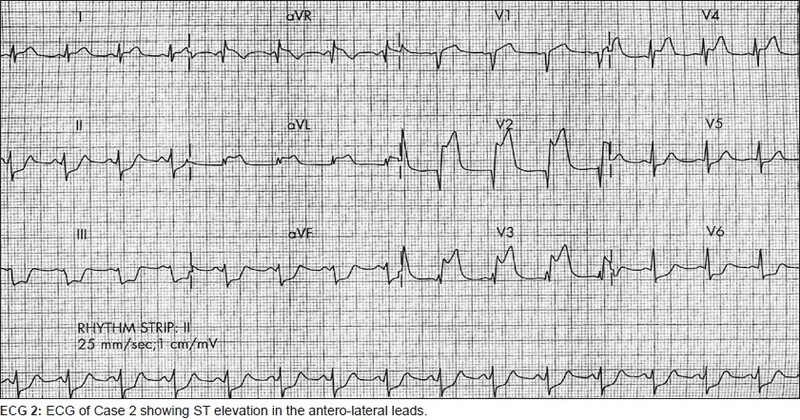 An ECG showed an antero-lateral ST elevation myocardial infarction (STEMI) [ECG 2]. The pain was relieved with intravenous morphine. The only cardiovascular risk factor she had was smoking (she had a history of 13-pack years of smoking). There was no history of connective tissue disease and she denied any illicit drug use. The antiphospholipid antibodies were negative. Coronary angiography revealed a dissection of the LAD from the ostium to the first diagonal [Figure 2]a. Her chest pain settled with resolution of her ECGs and she was hemodynamically stable. A decision was therefore made to manage her conservatively. She was commenced on aspirin, clopidogrel, low-molecular weight (LMW) heparin, nitrates, beta-blocker, and ACE inhibitor. She was started on glycoprotein IIb/IIIa inhibitor (Tirofiban) for the next 72 hours. Her echocardiogram demonstrated preserved left ventricular function with normal dimensions and no regional wall motion abnormalities. After one week, a repeat angiogram showed the persistence of the dissection flap but the thrombus had disappeared [Figure 2]b. After 5 days, the patient was discharged home on medical therapy. The patient remained asymptomatic when reviewed at 3 months and a repeat angiogram revealed a healed dissection flap [Figure 2]c.
We undertook a comprehensive review of the literature since it was first reported in 1931. We searched 'Medline' and 'PubMed' using the MESH headings 'pregnancy-related myocardial infarction', 'pregnancy-related coronary artery dissection,' and 'spontaneous coronary artery dissection' and 'acute coronary syndrome in pregnancy'. A manual search of the bibliographies of all selected reports was then performed. Koul et al.,  in 2001, reported 58 cases of pregnancy-associated SCAD (p-SCAD) between 1952 and 1999. Appleby et al.,  in 2009, reported additional 25 cases of p-SCAD between 1999 and 2008. A total of 118 case reports have been published since 1952, including our two cases [Table 1]. Our search revealed another 10 cases (case number 55, 56, 57, 58, 65, 70, 71, 72, 83, 117) between 1952 and 1999, which were not included by Koul et al.,  in their literature review [Table 1]. Between 1999 and 2008, there were additional 14 cases (case number 18, 19, 20, 21, 25, 29, 30, 31, 35, 37, 40, 42, 48, 49), which were not included by Appleby et al., in their review of the literature [Table 1]. Between 2008 and 2010, there were 10 case reports published. The mean age at presentation was 32.62 years (youngest 22 years; oldest 44 years). The mean parity was 1.08. The earliest reported case was at first trimester and the latest was at 3 months postpartum. There were 92 (77%) postpartum reported cases (earliest 2 days postpartum; latest 3 month postpartum) and 27 (23%) cases during gestation (earliest 20 weeks pregnancy; latest 40 weeks gestation). The pathogenesis of SCAD is unknown. The body undergoes different hormonal and hemodynamic changes during pregnancy and in the post-partum period; it may take upto six months after delivery for the body to achieve the pre-pregnancy status. Several theories have been postulated with regards to p-SCAD. It is suggested that the morphological changes in arterial wall associated with hemodynamic changes may be a contributory factor. Excess progesterone during pregnancy induces the loss of normal corrugation of elastic fibres and degeneration of medial wall collagen and all this may result in weakening of the arterial wall leading to arterial dissection. Heafner et al.,  suggested a two-step process leading to SCAD: an initial intimal rupture followed by delayed bleeding in tunica media likely caused by the clotting changes that occur in pregnancy. Bleeding from vasa vasorum into tunica media has been proposed as a possible cause of arterial dissection. , Robinowitz et al., postulated an association with vasculitis and peri-adventitial infiltrates composed of eosinophilic lymphocytes or histiocytes. Dowling et al.,  proposed that peri-adventitial inflammation were a consequence of SCAD and not the actual cause. Cocaine abuse and the strenuous physical exercise have been suggested as possible causes. ,,, Koul et al.,  postulated that the hemodynamic changes that occur during pregnancy may initiate the intimal tear and subsequent hemorrhage into the media of coronary artery. A review of the published literature revealed that LAD was involved in 49 (41%) of cases and RCA in 13 (11%); 42 (35%) had multivessel dissection. Other vessels were less frequently involved: LMS 7 (6%), LCx 5 (4.2%), OM 1 (0.84), and no information was available in 2 (1.68%) cases. The information regarding the safety of some of these drugs in pregnancy is limited. The drugs, which may be administered safely during pregnancy include unfractionated heparin or LMW heparin, aspirin, beta blockers, nitrates, morphine, and frusemide. Angiotensin-converting enzyme inhibitors and angiotensin receptor blockers are contra-indicated due to the risks to the fetus. , Clopidogrel is not recommended during breast feeding; its safety in pregnancy is however unknown. The safety of glycoprotein IIb/IIIa inhibitors in pregnancy is not known. The use of thromboytics in pregnancy remains controversial. They may resolve the thrombus in the false lumen leading to improvement of the flow in the true lumen. They may lead to further extension of the existing dissection by lysing a false lumen thrombus. , Pregnancy therefore remains a relative contraindication to thrombolytic therapy  and is best avoided in these circumstances. The literature review revealed that the thrombolytics were used in 9 (7.56%); 96 (86%) did not have any thrombolytics. No information was available in 14 (12%) cases. Percutaneous coronary intervention is the treatment of choice in SCAD with involvement of a single vessel with ongoing ischemia. Whether Drug-Eluting Stents(DES) have any benefit over BMS in the setting of SCAD is not known and there have been no trials due to the rare occurrence of the condition. A review of the literature showed that 36 (30.25%) were treated medically; 25 (21%) had CABG, 25 (21%) had PCI, 3 (2.52%) had heart transplant, 1 (0.84%) had extrusion of hematoma, 2 (1.68%) had PCI and CABG, 24 (20.16%) did not have any treatment. Information was not available in 3 (2.52%) cases. Eighty-nine (75%) cases survived, whilst 25 (21%) died; no information was available in 5 (4.2%) cases. The prognosis of SCAD has improved in the recent years. An overall mortality of 66% was reported by Engleman et al., in a retrospective study in 1993. More recently, Koul et al., in 2001 reported a much lower mortality of 38%. Last reported death because of SCAD was in 1998, according to the literature review. First reported alive case was in 1978. Between 1952 and 1999, out of 64 cases, 37 (58%) cases survived; 25 (39%) cases died. No information available in 2 (3%) cases. Between 1999 and 2010, out of 55 cases, there was no reported death. No information was available in 3 (5.4%) cases. 1. Bac DJ, Lotgering FK, Verkaaik AP, Deckers JW. Spontaneous coronary artery dissection during pregnancy and postpartum. Eur Heart J 1995;16:136-8. 2. Badmanaban B, McCarty D, Mole DJ, McKeown PP, Sarsam MA. Sponataneous coronary artery dissection presenting as cardiac tamponade. Ann Thorac Surg 2002;73:1324-6. 3. Thistlethwaite PA, Trazi RY, Giordano FJ, Jamieson SW. Surgical management of spontaneous left main coronary artery dissection. Ann Thorac Surg 1998;66:258-60. 4. Aliyary S, Mariani MA, Verhorst PM, Hartmann M, Stoel MG, von Birgelen C. Staged therapeutic approach in spontaneous coronary dissection. Ann Thorac Surg 2007;83:1879-81. 5. Kearney P, Singh H, Hutter J, Khan S, Lee G, Lucey J. Spontaneous coronary artery dissection: A report of three cases and review of the literature. Postgrad Med J 1993;69:940-5. 6. Alvarez J, Deal CW. Spontaneous dissection of the left main coronary artery: Case report and review of the literature. Aust N Z J Med 1991;21:891-2. 7. Koul AK, Hollander G, Moskovits N, Frankel R, Herrera L, Shani J. Coronary artery dissection during pregnancy and the postpartum period: Two case reports and review of literature. Catheter Cardiovasc Interv 2001;52:88-94. 8. Almeda F, Barkatullah S, Kavinsky CJ. Spontaneous coronary artery dissection. Clin Cardiol 2004;27:377-80. 9. Rensing BJ, Kofflard M, Van den Brand MJ, Foley D. Spontaneous dissection of all three coronary arteries in a 33-week pregnant woman. Catheter Cardiovasc Interv 1999;48:207-10. 10. Klutstein MW, Tzivoni D, Bitran D, Mendzelevski B, Ilan M, Almagor Y. Treatment of spontaneous coronary artery dissection: Report of three cases. Catheter Cardiovasc Diagn 1997;40:372-6. 11. Pretty HC. Dissecting anneurysm of coronary artery in a woman aged 42; rupture. BMJ 1931;1:667. 12. Jorgensen MB, Aharonian V, Mansukhani P, Mahrer PR. Spontaneous coronary artery dissection: A cluster of cases with this rare finding. Am Heart J 1994;127:1382-7. 13. Mohamed HA, Eshawesh A, Habib N. Spontaneous coronary dissection. A case and review of the literature. Angiology 2002;53:205-11. 14. Capuano C, Sesana M, Predolini S, Leonzi O, Cuccia C. Case report: A very large dissection in the left anterior descending coronary artery of a 56-year-old man. Cardiovasc Revasc Med 2006;7:240-2. 15. Kaminemi R, Sadhu A, Alpert J. Spontaneous coronary artery dissection: Report of two cases and a 50-year review of the literature. Cardiol Rev 2002;10:279-84. 16. Arnold JR, West NE, van Gaal WJ, Karamitsos TD, Banning AP. The role of intravascular ultrasound in the management of spontaneous coronary artery dissection. Cardiovasc Ultrasound 2008;6:24. 17. Maeder M, Ammann P, Angehrn W, Rickli H. Idiopathic spontaneous coronary artery dissection: Incidence, diagnosis and treatment. Int J Cardiol 2005;101:363-9. 18. Appleby CE, Barolet A, Ing D, Ross J, Schwartz L, Seidelin P, et al. Contemporary management of pregnancy-related coronary artery dissection: A single-centre experience and literature review. Exp Clin Cardiol 2009;14:e8-16. 19. Heefner WA. Dissection haematoma of the coronary artery. JAMA 1973;223:550-1. 20. Bager AC, Beeuwkes R, Ainey L, Silverman K. Hypothesis: Vasa vasorum and neovascularisation of human coronary arteries. A possible role in the pathophysiology of atherosclerosis. N Engl J Med 1984;310:175-7. 21. Robinowitz M, Virmani R, McAllister H. Spontaneous coronary artery dissection and eosinophilic inflammation: A cause and effect relationship. Am J Med 1982;72:923-8. 22. Dowling GP, Buja LM. Spontaneous coronary artery dissection occurs with and without peri-adventitial inflammation. Arch Pathol Lab Med 1987;111:470-2. 23. Steinhauer JR, Caulfield JB. Spontaneous coronary artery dissection associated with cocaine use: A case report and brief review. Cardiovasc Pathol 2001;10:141-5. 24. Jaffe BD, Broderick TM, Leier CV. Cocaine-induced coronary artery dissection. N Engl J Med 1994;330:510-1. 25. Sherrid MV, Mieres J, Mogtader A. Onset during exercise of spontaneous coronary artery dissection and sudden death. Occurrence in a trained athlete: Case report and review of prior cases. Chest 1995;108:284-7. 26. Ellis CJ, Haywood GA, Monro JL. Spontaneous coronary artery dissection in a young woman resulting from intense gymnasium "work-out". Int J Cardiol 1994;47:193-4. 27. Masuda T, Akiyama H, Kurosawa T, Ohwada T. Long-term follow-up of coronary artery dissection due to blunt chest trauma with spontaneous healing in a young woman. Intensive Care Med 1996;22:450-2. 28. Borczuk AC, van Hoeven KH, Factor SM. Review and hypothesis: The eosinophil and peripartum heart disease (myocarditis and coronary artery dissection)--coincidence or pathogenetic significance? Cardiovasc Res 1997;33:527-32. 29. Bonacchi M, Prifti E, Giunti G, Frati G, Leacche M, Brancaccio G, et al. Emergency management of spontaneous coronary artery dissection. J Cardiovasc Surg (Torino) 2002;43:189-93. 30. Martín Dávila F, Delgado Portela M, García Rojo M, González García J, Puig Rullán AM, López Pérez R, et al. Coronary artery dissection in alpha-1-antitrypsin deficiency. Histopathology 1999;34:376-8. 31. Azam MN, Roberts DH, Logan WF. Spontaneous coronary artery dissection associated with oral contraceptive use. Int J Cardiol 1995;48:195-8. 32. Tsimikas S, Giordano FJ, Tarazi RY, Beyer RW. Spontaneous coronary artery dissection in patients with renal transplantation. J Invasive Cardiol 1999;11:316-21. 33. Marik PE, Marik E. Coronary artery dissection after a rugby injury: A case report. S Afr Med J 1990;77:586-7. 34. Saunders SL. Spontaneous coronary artery dissection possibly related to drug hypersensitivity in a male. Gen Physiol Biophys 1990;9:291-9. 35. Kaufman G, Engelbrecht JW. Hemorrhagic intramedial dissection of coronary artery with cystic medial necrosis. Am J Med 1969;24:409-13. 36. Cocco P, Thiene G, Corrado D, Lodovichetti G, Pennelli N. Ematoma (aneurisma) dissecante spontaneo delle coronarie e morte improvvisa. G Ital Cardiol 1990;20:795-800. 37. Van den Branden BJ, Bruggeling WA, Corbeij HM, Dunselman PH. Sponataneous coronary artery dissection in the postpartum period. Neth Heart J 2008;16:412-4. 38. Engelman DT, Thayer J, Derossi J, Scheinerman J, Brown L. Pregnancy related coronary artery dissection: A case report and collective review. Conn Med 1993;57:135-9. 39. Bulkley BH, Roberts WC. Dissecting aneurysm (hematoma) limited to coronary artery: A clinic-pathologic study of six patients. Am J Med 1973;55:747-56. 40. Mark D, Kong Y, whalen R. Variant angina and spontaneous coronary artery dissection. Am J Cardiol 1985;56:485-6. 41. Van Der Bel-Khan J. Recurrent primary coronary artery dissecting aneurysm (hematoma). Am J Clin Pathol 1982;78:394-8. 42. Palank E, Dawson J, Cowen G, Tysinger J. Primary dissecting aneurysm of the right coronary artery. Chest 1977;72:774-6. 43. Barrett JM, Van Hooydonk JE, Boehm FH. Pregnancy-related rupture of arterial aneurysms. Obstet Gynecol Surv 1982;37:557-66. 44. Dhawan R, Singh G, Fesniak H. Spontaneous coronary artery dissection: The clinical spectrum. Angiology 2002;53:89-92. 45. Roth A, Elkayam U. Acute myocardial infarction associated with pregnancy. Ann Intern Med 1996;125:751-62. 46. Madu EC, Kosinski DJ, Wilson WR, Burket MW, Fraker TD, Ansel GM. Two vessel coronary artery dissection in the peripartum period. Angiology 1994;45:809-16. 47. Mortensen KH, Thuesen L, Kristensen IB, Christiansen EH. Spontaneous coronary artery dissection: A Western Denmark Heart Registry Study. Catheter Cardiovasc Interv 2009;74:710-7. 48. Antman EM, Anbe DT, Armstrong PW, Bates ER, Green LA, Hand M, et al. ACC/AHA Guidelines for the management of patients with ST-elevation myocardial infarction: Executive summary. J Am Coll Cardiol 2004;44:671-719. 49. Anderson JL, Adams CD, Antman EM, Bridges CR, Califf RM, Casey DE Jr, et al. ACC/AHA 2007 guidelines for the management of patients with unstable angina/non-ST-elevation myocardial infarction-Executive summary: A report of the American College of Cardiology/American Heart Association Task Force on Practice Guidelines (Writing Committee to Revise the 2002 Guidelines for the Management of Patients With Unstable Angina/Non-ST-Elevation Myocardial Infarction). J Am Coll Cardiol 2007;50:652-726. 50. Wilson AM, Boyle AJ, Fox P. Management of ischemic heart disease in women of child-bearing age. Intern Med J 2004;34:694-7. 51. Atay Y, Yagdi T, Turkoglu C, Altintig A, Buket S. Sponatneous dissection of the left main coronary artery: A case report and review of the literature. J Card Surg 1996;11:371-5. 52. Celik SK, Sagcan A, Altintig A, Yuksel M, Akin M, Kultursay H. Primary spontaneous coronary artery dissections in atherosclerotic patients. Eur J Cardiothorac Surg 2001;20:573-6. 53. Versaci F, Tomai F, Gaspardone A, Proietti F, Chiariello L, Gioffrè PA. Stent implantation for spontaneous coronary dissection. Cardiologia 1997;42:971-4. 54. Paez M, Buisan F, Herrero E. Spontaneous dissection of the left coronary artery trunk during the postpartum period treated with revascularization surgery, ventricular assistance and a successful heart transplant. Acta Anaesthesiol Scand 2007;51:960-1. 55. Lane JE, Cartledge RG, Johnson JH. Successful surgical treatment of spontaneous coronary artery dissection. Curr Surg 2001;58:316-8. 56. Ardehali R, Brinton TJ, Wilson AM, Gradman M, Vagelos RH, Lee DP. Recurrent spontaneous coronary artery dissection with transient left ventricular systolic dysfunction. Int J Cardiol 2007;116:e48-50. 57. Sarmento-Leite R, Machado PR, Garcia SL. Spontaneous coronary artery dissection: Stent it or wait for healing? Heart 2003;89:164. 58. Shirakawa Y, Matsumiya G, Ohtake S, Sawa Y, Kagisaki K, Matsuda H. Emergency operation for sponataneous coronary artery dissection in young female. Asian Cardiovasc Thorac Ann 2002;10:58-60. 59. Cini R, Iezzi F, Sordini P, Pasceri V. Sponataneous left coronary artery dissection. Interact Cardiovasc Thorac Surg 2008;7:943-4. 60. Curiel P, Spinelli G, Petrella A, Gori A, De Maria R, Bonacina E, et al. Postpartum coronary artery dissection followed by heart transplantation. Am J Obstet Gynaecol 1990;163:538-9. 61. Benham R, Tillinghast S. Thrombolytic therapy in spontaneous coronary artery dissection. Clin cardiol 1991;14:611-4. 62. Vogiatzis I, Hadjimiltiades S, Sachpekidis V, Parcharidis G. Spontaneous coronary artery dissection and acute myocardial infarction during pregnancy. Hellenic J Cardiol 2010;51:74-80. 63. Teniente-Valente R, Delgado-Sánchez A, Sánchez M, Mendoza-Gómez R, Vargas L, Medina-Torres O, et al. Inferior acute myocardial infarction associated to coronary artery dissection in the postpartum. Int J Cardiol 2009;7:2. 64. Chue CD, Routledge HC, Townend JN. Spontaneous coronary artery dissection and the role of percutaneous coronary intervention: To treat or not to treat? J Invasive Cardiol 2009;21:E44-7. 65. Rahman S, Abdul-Waheed M, Helmy T, Huffman LC, Koshal V, Guitron J, et al. Spontaneous left main coronary artery dissection complicated by pseudoaneurysm formation in pregnancy: Role of CT coronary angiography. J Cardiothorac Surg 2009;4:15. 66. Al-Mohaissen MA. Spontaneous left main coronary artery dissection. A rare cause of acute coronary syndrome. Saudi Med J 2009;30:1476-9. 67. Azzarelli S, Fiscella D, Amico F, Giacoppo M, Argentino V, Fiscella A. Multivessel spontaneous coronary artery dissection in a postpartum woman treated with multiple drug-eluting stents. J Cardiovasc Med (Hagerstown). 2009;10:340-3. 68. Shahabi S, Smith NA, Chanana C, Abbott JD, Copel J, Setaro JF. Pregnancy-associated myocardial infarction: A report of two cases and review of the literature. Ups J Med Sci 2008;113:325-30. 69. Iltumur K, Karahan Z, Ozmen S, Danis R, Toprak N. Spontaneous coronary artery dissection during hemodialysis in the post-abortion period. Int J Cardiol 2008;127:e45-7. 70. Halmai L, Sepp R, Thury A, Gavallér H, Ungi I, Rudas L. Coronary artery dissection in the postpartum period--A case study. Orv Hetil 2008;149:457-63. 71. Satoda M, Takagi K, Uesugi M, Morishima I, Mukawa H, Tsuboi H, et al. Acute myocardial infarction caused by spontaneous postpartum coronary artery dissection. Nat Clin Pract Cardiovasc Med 2007;4:688-92. 72. Kalra N, Greenblatt J, Ahmed S. Postpartum spontaneous coronary artery dissection (SCAD) managed conservatively. Int J Cardiol 2008;129:e53-5. 73. Sherif HM, Nguyen HC, Sarter BH, West JT, Lucente E, Fink DM, et al. Spontaneous coronary dissection in late pregnancy: A multidisciplinary approach to management. Ann Thorac Surg 2008;85:1793-4. 74. Goland S, Schwarz ER, Siegel RJ, Czer LS. Pregnancy-associated spontaneous coronary artery dissection. Am J Obstet Gynecol 2007;197;e11-3. 75. Schiff JH, Gries A, Ehehalt R, Elsaesser M, Katus HA, Meyer FJ. A pregnant woman with acute myocardial infarction due to coronary artery dissection: Pre-hospital and in-hospital management. Resuscitation 2007;73:467-74. 76. Kiernan TJ, Rochford M. Postpartum spontaneous coronary artery dissection: An important clinical link with anticardiolipin antibody. Int J Cardiol 2007;114:E75-6. 77. Frey BW, Grant RJ. Pregnancy-associated coronary artery dissection: A case report. J Emerg Med 2006;30:307-10. 78. Luceri S, Paolillo V, De Benedictis M, Scrocca I. Spontaneous dissection of the left coronary tree after an interruption of pregnancy treated with extensive stenting. J Invasive Cardiol 2006;18:e117-20. 79. Gasparovic H, Ugljen R, Coric V, Gosev I, Gasparovic V, Jelic I. Surgical treatment of a postpartal spontaneous left main coronary artery dissection. Thorac Cardiovasc Surg 2006;54:70-1. 80. Allagui E, Delmotte P, Joly E, Vachiery JL, Preumont N, Renard M. Spontaneous coronary artery dissection on the 10th post-partum day: A case report. Arch Mal Coeur Vaiss 2006;99:255-8. 81. Schroder C, Stoler RC, Branning GB, Choi JW. Postpartum multivessel spontaneous coronary artery dissection confirmed by coronary CT angiography. Proc (Bayl Univ Med Cent) 2006;19:338-41. 82. Rogers IS, Rinaldi MJ, Humphrey CB, Boden WE, Dougherty JE. Postpartum dissection of the left main coronary artery. Clin Cardiol 2006;29:175-8. 83. Chabrot P, Motreff P, Boyer L. Postpartum spontaneous coronary artery dissection: A case of pseudoaneurysm evolution detected on MDCT. AJR Am J Roentgenol 2006;187:W660. 84. Phillips LM, Makaryus AN, Beldner S, Spatz A, Smith-Levitin M, Marchant D. Coronary artery dissection during pregnancy treated with medical therapy. Cardiol Rev 2006;14:155-7. 85. Hammond AS, Bailey PL. Acute spontaneous coronary artery dissection in the peripartum period. J Cardiothorac Vasc Anesth 2006;20:837-41. 86. Bravio I, Castelão N, Duarte R, Telles R, Roquette J. Post-partum spontaneous coronary artery dissection. Clinical report. Rev Port Cir Cardiotorac Vasc 2005;12:153-6. 87. Nallamothu BK, Saint M, Saint S, Mukherjee D. Double jeopardy. N Engl J Med 2005;353:75-80. 88. Terrovitis JV, Kanakakis J, Nanas JN. Spontaneous coronary artery dissection as a cause of acute myocardial infarction in the postpartum period. Cardiol Rev 2005;13:211-3. 89. Juszczyk M, Marnejon T, Hoffman DA. Spontaneous coronary artery dissection postpartum. J Invasive Cardiol 2004;16:524-6. 90. Krishnamurthy M, Desai R, Patel H. Spontaneous coronary artery dissection in the postpartum period: Association with antiphospholipid antibody. Heart 2004;90:e53. 91. Jaigobin C, Silver FL. Stroke secondary to post-partum coronary artery dissection. Can J Neurol Sci 2003;30:168-70. 92. Shah P, Dzavik V, Cusimano RJ, Sermer M, Okun N, Ross J. Spontaneous dissection of the left main coronary artery. Can J Cardiol 2004;20:815-8. 93. McKechnie RS, Patel D, Eitzman DT, Rajagopalan S, Murthy TH. Spontaneous coronary artery dissection in a pregnant woman. Obstet Gynecol 2001;98:899-902. 94. Lerakis S, Manoukian S, Martin RP. Transesophageal echo detection of postpartum coronary artery dissection. J Am Soc Echocardiogr 2001;14:1132-3. 95. Eby CS, McBride LR. Postpartum coronary artery dissection complicated by heparin-induced thrombocytopenia and thrombosis. Ann Thorac Surg 2001;71:1025-7. 96. Togni M, Amann FW, Follath F. Spontaneous multivessel coronary artery dissection in a pregnant woman treated successfully with stent implantation. Am J Med 1999;107:407-8. 97. Elming H, Køber L. Spontaneous coronary artery dissection. Case report and literature review. Scand Cardiovasc J 1999;33:175-9. 98. Samuels LE, Kaufman MS, Morris RJ, Brockman SK. Postpartum coronary artery dissection: Emergency coronary artery bypass with ventricular assist device support. Coron Artery Dis 1998;9:457-60. 99. Vilke GM, Mahoney G, Chan TC. Postpartum coronary artery dissection. Ann Emerg Med 1998;32:260-2. 100. Porras MC, Ares MA, Gill JZ. Intracoronary stenting for postpartum coronary artery dissection. Ann Intern Med 1998;128:873. 101. Koller PT, Cliffe CM, Ridley DJ. Immunosuppressive therapy for peripartum-type spontaneous coronary artery dissection: Case report and review. Clin Cardiol 1998;21:40-6. 102. Bucciarelli E, Fratini D, Gilardi G, Affronti G. Spontaneous dissecting aneurysm of coronary artery in a pregnant woman at term. Pathol Res Pract 1998;194:137-9. 103. Alcalá López J, Romero Hinojosa JA, González-Gay JM, Díaz Fernández JF, Melgares Moreno R, Ramírez Hernández JA, et al. Spontaneous postpartum coronary dissection. Rev Esp Cardiol 1998;51:844-6. 104. Almahmeed WA, Haykowski M, Boone J, Ling H, Allard M, Webb J, et al. Spontaneous coronary artery dissection in young women. Catheter Cardiovasc Diagn 1996;37:201-5. 105. Zampieri P, Aggio S, Roncon L, Rinuncini M, Canova C, Zanazzi G, et al. Follow up after spontaneous coronary artery dissection: A report of five cases. Heart 1996;75:206-9. 106. Silberman S, Fink D, Berko RS, Mendzelevski B, Bitran D. Coronary artery bypass surgery during pregnancy. Eur J Cardiothorac Surg 1996;10:925-6. 107. Manari A, Giacometti P, Vergoni W, Mastrangeli S, Guiducci U. Acute myocardial infarction in pregnancy in a patient with pseudoaneurysm of the left main coronary artery. G Ital Cardiol 1996;26:1437-43. 108. Coulson CC, Kuller JA, Bowes WA Jr. Myocardial infarction and coronary artery dissection in pregnancy. Am J Perinatol 1995;12:328-30. 109. Bateman AC, Gallagher PJ, Vincenti AC. Sudden death from coronary artery dissection. J Clin Pathol 1995;48:781-4. 110. Mansur LI, Minns GO, Steckley RA. Postpartum myocardial infarction: Association with primary coronary artery dissection. Cleve Clin J Med 1995;62:261-8. 111. Efstratiou A, Singh B. Combined spontaneous postpartum coronary artery dissection and pulmonary embolism with survival. Catheter Cardiovasc Diagn 1994;31:29-33. 112. Mather PJ, Hansen CL, Goldman B, Inniss S, Piña I, Norris R, et al. Postpartum multivessel coronary dissection. J Heart Lung Transplant 1994;13:533-7. 113. Verkaaik AP, Viser W, Deckers JW, Lotgering FK. Multiple coronary artery dissections in a woman. Br J Anaesth 1993;71:301-2. 114. Emori T, Goto Y, Maeda T, Chiba Y, Haze K. Multiple coronary artery dissections diagnosed in vivo in a pregnant woman. Chest 1993;104:289-90. 115. Michaux L, Lefebvre C, Lebaupin C, Lo Presti L, Coche E. Spontaneous dissection of the anterior interventricular coronary artery in the postpartum period. Rev Med Interne 1993;14:49-50. 116. Corrado D, Thiene G, Cocco P, Frescura C. Non-atherosclerotic coronary artery disease and sudden death in the young. Br Heart J 1992;68:601-7. 117. Bertrand E, Seka R, Adoh M, Dori RN, Odi-Assamoi M, Cailleau G, et al. Spontaneous coronary artery dissection: Apropos of a case with associated spasm and regression of the dissection. Arch Mal Coeur Vaiss 1993;86:249-53. 118. Hayden J, Mort T, Rintel T. Acute coronary artery dissection during pregnancy. Int J Obstet Anesth 1991;1:43-5. 119. Pardo J, González B, Novoa O, Pumarino R, Oppliger E, Godoy D. Acute post-partum infarct of the myocardium secondary to a spontaneous dissection of the coronary artery. Rev Med Chil 1990;118:300-5. 120. Gonzalez JI, Hill JA, Conti CR. Spontaneous coronary artery dissection treated with percutaneous transluminal angioplasty. Am J Cardiol 1989;63:885-6. 121. Lette J, Gagnon A, Cerino M, Prénovault J. Apical hypertrophic cardiomyopathy with spontaneous postpartum coronary artery dissection. Can J Cardiol 1989;5:311-4. 122. Movsesian MA, Wray RB. Postpartum myocardial infarction. Br Heart J 1989;62:154-6. 123. Nishikawa H, Nakanishi S, Nishiyama S, Nishimura S, Kato K, Yanagishita Y, et al. Primary coronary artery dissection: Its incidence, mode of the onset and prognostic evaluation. J Cardiol 1988;18:307-17. 124. Sage MD, Koelmeyer TD, Smeeton WM. Fatal postpartum coronary artery dissection. A light- and electron-microscope study. Am J Forensic Med Pathol 1986;7:107-11. 125. Bonnet J, Aumailley M, Thomas D, Grosgogeat Y, Broustet JP, Bricaud H. Spontaneous coronary artery dissection: Case report and evidence for a defect in collagen metabolism. Eur Heart J 1986;7:904-9. 126. Vicari R, Eybel C, Monson D. Survival following spontaneous coronary artery dissection: Surgical repair by extrusion of intramural hematoma. Am Heart J 1986;111:593-4. 127. Hankins GD, Wendel GD, Leveno KJ, Stoneham J. Myocardial infarction during pregnancy. Obstet Gynecol 1985;65:139-46. 128. Johnson KM, Carpenter Pl, Geakle T, Barlow JF. Twenty seven year old postpartum Gravid 4 Para 4 with hypertension and chest pain. S D J Med 1984;37:17-22. 129. Chokron R, Thomas D, Leprince JL, Szwarc G, Gandjbakhch I, Grosgogeat Y. Isolated primary dissection of coronary arteries. Apropos of 3 cases with a favorable development. Arch Mal Coeur Vaiss 1983;76:886-92. 130. Ehya H, Jackson M, Weitzner S. Postpartum dissecting aneurysm of coronary arteries in a patient with sarcoidosis. South Med J 1980;73:87-8. 131. Pisano RV, Taylor MB, Sopher IM. Dissecting coronary artery aneurysm: A report of two cases. J Forensic Sci 1979;24:18-25. 132. Jewett JF. Two dissecting coronary artery aneurysms postpartum. N Engl J Med 1978;298:1255-7. 133. Shaver PJ, Carrig TF, Baker WP. Postpartum coronary artery dissection. Br Heart J 1978;40:83-6. 134. Asuncion CM, Hyun J. Dissecting intramural hematoma of the coronary artery in pregnancy and the puerperium. Obstet Gynecol 1972;40:202-10. 135. Cloudon DG, Cloudon DB, Edwards JE. Primary dissecting aneurysm of coronary artery: A cause of acute myocardial ischemia. Circulation 1972;45:256-9. 136. Di Maio VJ, Di Maio DJ. Postpartum dissecting coronary aneurysm. N Y State J Med 1971;71:767-9. 137. Palomino SJ. Dissecting intramural hematoma of the left coronary artery in the puerperium: A case report and survey of literature. Am J Clin Pathol 1968;51:119-25. 138. Brody GL, Burton JF, Zawadzki ES, French JA. Dissecting aneurysms of the coronary artery. N Engl J Med 1965;273:1-6. 139. Burton JF, Zawadzki ES. The coronary aneurysm. J Forensic Sci 1962;7:486-92. 140. Wells AL. Dissecting aneurysm of coronary artery in the puerperium. J Pathol Bact 1960;79:404-5. 141. Boschetti AE, Levine A. Cystic medionecrosis with dissecting aneurysm of coronary arteries. Arch Intern Med 1958;102:562-70. 142. Lovitt WV, Corzine WJ. Dissecting intramural hemorrhage of anterior descending branch of left coronary artery. Am Arch Pathol 1952;54:458-62. 21 Is This Spontaneous Coronary Intramural Hematoma or Fibrotic Plaque?